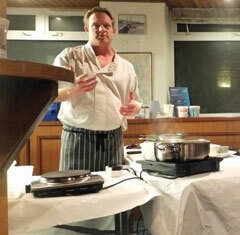 When the sailing season starts to wind down, the Club's programme of evening talks kicks in. From the beginning of October through to the end of March the Clubhouse plays host to an eclectic collection of social activities. The programme includes informal talks on a wide variety of topics, from photography, mining, hedgehogs, time, gardening to nautical topics like rigging, life jackets, Cornish marine life, and boat design. On a more practical level we have cookery demonstrations from Arty Williams of the Cove Restaurant and pasty making from Charlie Choak; and then there are the unclassifiable talks. And they all turn out to be interesting. Every so often speakers cancel, sometimes at very short notice. Over the last few years this has only resulted in one evening where no presentation was made. To be fair it was a wild and stormy night, and we were happy to huddle round the bar. In January 2017 we had an unprecedented three cancellations or postponements. The show still went on, with some re-arrangement of planned talks, and Club members stepping in with alternatives. All for one and one for all at FSC! In addition we have the annual prizegiving, the Christmas Party, the Quiz night, where FSC competes with teams representing other clubs in the Port, and in which Flushing usually fails to emerge triumphant. With a handsome trophy to play for, we have to up our game. Early in the New Year we have a Car Treasure Hunt, to help revitalise after over-indulgence. 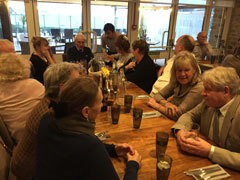 One of the most popular events is Club at the Cove at the Cove Restaurant in Maenporth, where we enjoy a pre-season social evening with food prepared by the ever popular Arty Williams. A fully stocked bar is available at the Club, serving wine, spirits and local ales. The Clubhouse opens at 19:30 and talks start at 20:00. Members, friends and non members are welcome to join in with our winter talks and workshops. All talks are free of charge. Sep 25: Double Bill: the season Wash-up will start promptly at 19:00 and be followed equally promptly at 20:00 by Astonishing Seal Pups: Sue Sayer of the Cornwall Seal Group Research Trust will present her photo and video highlights of the latest seal survey. CSGRT study wild seals all around Cornwall and Devon. Nov 27: Beer enthusiast Dave Ward will give us an insight into Real Ale. Optional practical (tasting) to follow at small cost. Dec 11: !! It’s Party Time!! Add a dash of colour to our Xmas party and come dressed as a Christmas decoration (optional). Bring a plate of finger food to share. Jan 6: (Sunday) Treasure Hunt: Gaye Slater and David. Meet at the Club at 10:00, returning around midday for a bowl of wholesome nourishing homemade soup. Jan 8: Presentation of the Club's Development Plan: a special meeting at Flushing Sailing Club where members of the club, anyone from the village, and indeed all interested parties have an opportunity to ask questions about the future of our club. Jan 15: Andrew Nancarrow talks about the replica of Captain Bligh's open boat in which he returns from the mutiny. Jan 23: (Wednesday) Special General Meeting to approve the change of legal status of the club from an unincorporated association to a Charitable Incorporated Organisation (CIO). Feb 19: Working Sail in the West country; Oyster dredging in the Fal. Dr Adam Spargo, Mate on the Trading Ketch Bessie Ellen and Skipper on the Brixham trawler the Golden Vanity. Mar 19: Race Officer and Skippers Briefing. Collect Sailing Instruction booklet and membership card. Mar 26: Club Supper at The Cove, Menu, contact Inez Thompson with your choices. 12/12: Christmas Party, just bring a plate of food to share with friends, enjoy a cheering glass, wince to the sentimental Christmas music, (maybe) win a raffle prize, and have fun, all for Free! 13/12: Christmas Party, free, just bring a plate of food to share; raffle, bar open, come and enjoy a Christmas evening with your sailing friends. 7/3: Interclub Quiz: all clubs invited. Come and support your club. 21/3: Officer of the Day and Skippers briefing; to be followed by an informal workshop on the recreational uses of the Fal estuary, run by Sarah Furley of Cornwall Council. 8th December: Christmas Party. Just bring a plate of food to share with friends, enjoy a cheering glass, (maybe) win a raffle prize, and have fun, for Free! 3rd January (Sunday): Treasure Hunt, brought to you by Derek & Jeanette Hill, Jack Penty and Inez Thompson. Nothing strenuous, all from the comfort of your car.